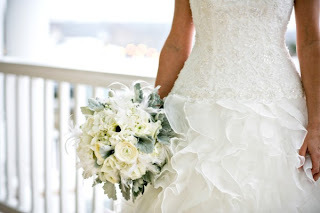 Thought I would share some of the creative tips for wedding floral design from eleGala.com — trends for 2011! Arrangements with a just-picked, unstructured look are replacing the tightly bound bouquet and centerpiece shapes of previous seasons. Ensure a modern, not messy, look by choosing the right flowers. Hearty blooms like roses, orchids, and amaranthus work well in looser arrangements because of the sleek shape of the individual blooms. Seeded eucalyptus will add texture without looking messy. Also consider incorporating non-floral elements like feathers, wheat, berries, and crystals to add interest and depth. Believe it or not, pink is back. 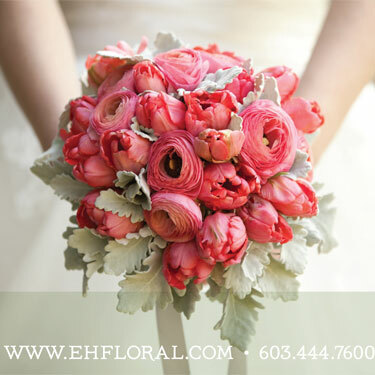 From bright, honeysuckle, and coral shades to classic, sophisticated blush tones, we can expect to see both in the 2011 wedding color palette. Many brides are daring to think beyond basic hot pink by incorporating the softer shades into their floral schemes with garden roses, peonies, and even mini-carnations, which offer great texture. Avoid chocolate brown (so last year!) and instead pair your brighter coral pink with tangerine and lemon yellow, while warm grays and gentle golds will complement the softer, rosey, champagne pink. Here are a couple pink bouquets photographed by Rodeo & Co.
Grey is the new black – I love the way they grey dusty miller contrasts and softens. Options abound beyond the basic floral vase for holding your flowers. Consider instead mixing and matching clusters of unique containers like old bottles, mason jars, vintage tins, pitchers, or milk glass to add interest and reflect your wedding theme. Some ideas: Fill watering cans with wild flowers for a garden fete, or cluster old apothecary jars with just one or two blooms in each each. These are some gorgeous ideas for a flower arrangement. I particularly the white bouquet pictured above since it is so clean and simple. My niece is getting married soon and I’ll have to show her these ideas and see if any of them match her wedding plans. Thanks for showing these awesome ideas!